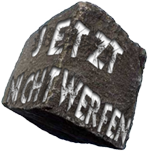 As your personal sign ANTIviolence the projekt "Unthrown Stones" invites you to activly not throw a stone. This is your opportunity to participate in this art-project and set a personal statement against violence and for peace and freedom. 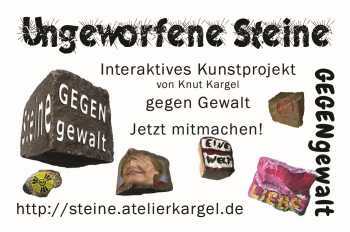 For each of your stones you can print a certificate confirming that you have been actively involved in the art project. 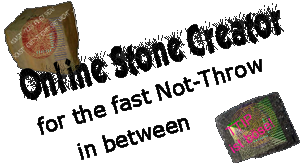 You can also print postcards of the stones. 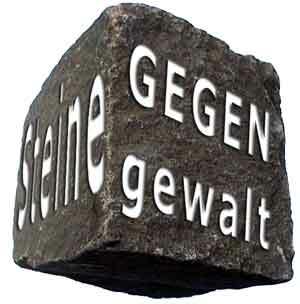 Another opportunity of the projekt "Unthrown Stones" is to make ANTIviolence a theme in kindergarten and school. We\'re looking forward to a brisk demand! Under the Link "Not Throw" -> "Participate" you find all details for your account.